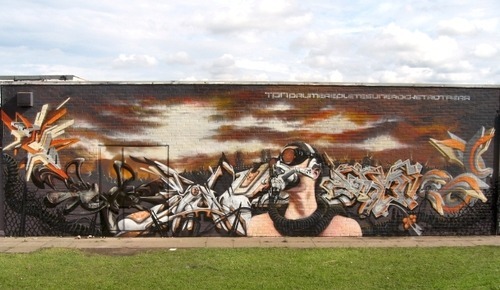 This interview was written by the Street Art Curator on behalf of GSA. 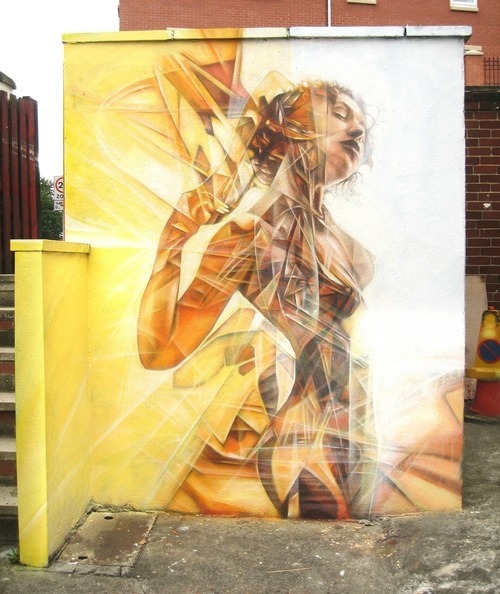 Replete is a 15 year veteran of the street art scene, based in Leeds, UK. 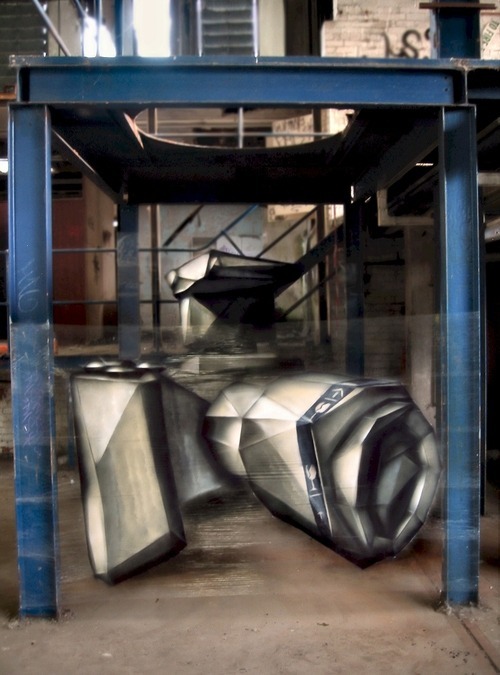 His works often incorporate old school writing styles with newer techniques such as cling film to create mind blowing anamorphic 3D optical illusions. 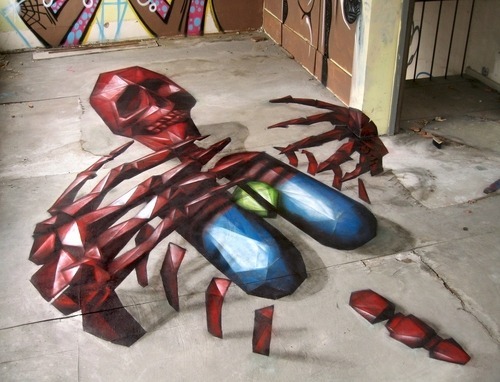 His pieces are extremely highly detailed, using menagerie of different painting styles and materials. 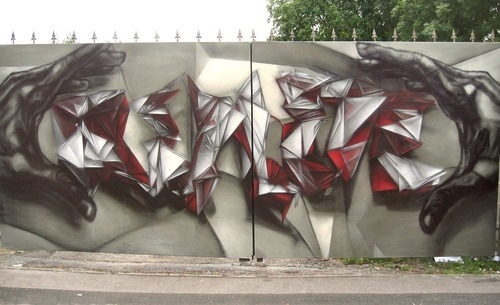 Utilising derelict, industrial backdrops, he makes his pieces jump to life with an extraordinary eye for detail, not missing any intricacies. 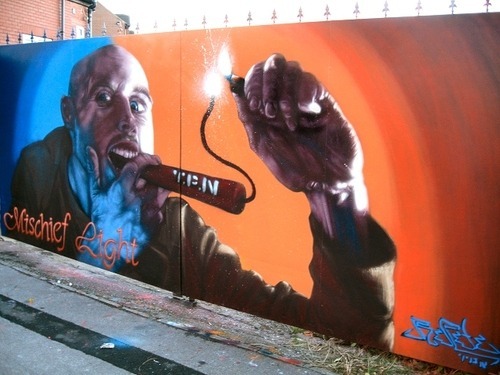 Replete is a street art maestro; his 3D optical illusions are second to none, in this regard, truly one of the finest artists on the UK scene. I have been painting on and off for around 15 years, during the second era of the hip hop movement starting back in 1992. Everything began with the creative process, I always found myself writing and drawing on every surface available, and this was apparent throughout my childhood. The themes mostly during the younger days were usually associated with sci-fi movies or television shows such as Star Wars and Battlestar Galactica much of where my inspiration comes from even today. My name came from a series of vivid dreams where I embodied an ant, to cut a long story short, a few days later I had randomly came across a species of ant called the Replete or Honey Ant, this species of ant selflessly make themselves into living honey pots by storing honey in their abdomens, which then in times of drought give sustenance to other ants in their colony, this is how I see myself, the purpose of my art is to give nourishing imagery to those that have hungry eyes. I have not had any formal training or education. 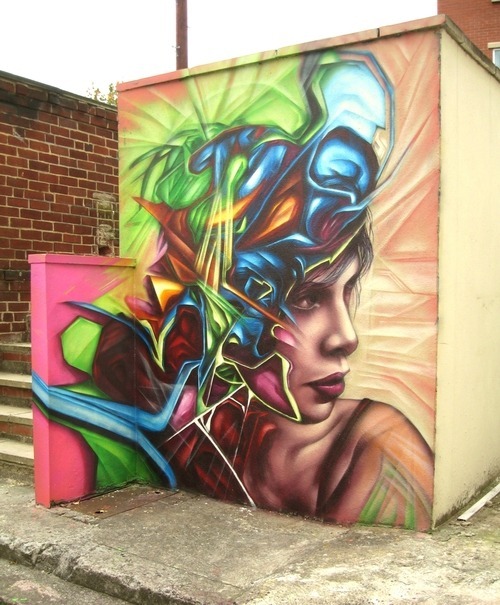 I left a school at 16 with many of my art teacher telling me that graffiti was not a form of art, as they did not see it as part of the usual idealistic constructs of “art”. All my techniques have evolved from trial and error. Over a period of time new techniques have come to exist, one technique in particular involves using my hand as a moveable masking template or brush to smear and alter paint to create a desired effect have become a permanent part of my range. Locations range anywhere from the side of an apartment block to the husk of a factory; dirt, rust and decay fascinate me, as does heavy machinery, which explains why I feel most at home painting in derelict factories. 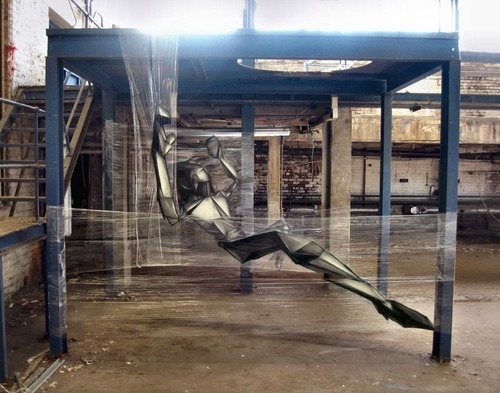 I would describe my style as incorporates what I call insectile forms – figures which have close likeliness to creatures in the insect world, to origami styled figures and 3D illusionary pieces. The ability to create something from thin air has always fired my imagination. 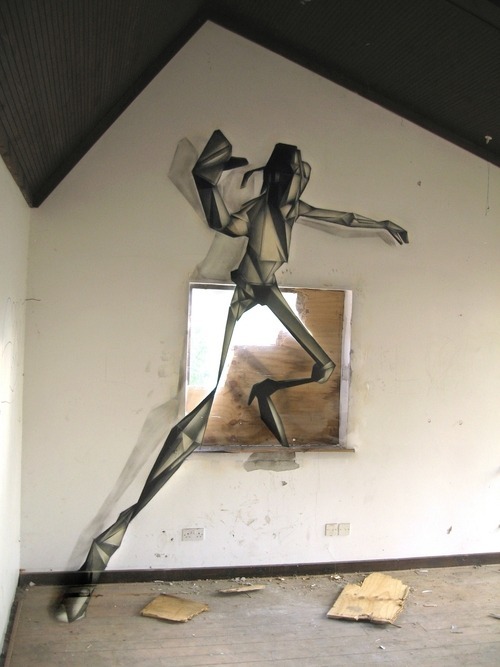 Walls were the initial launch pad but I have now spread my artwork to floors, and suspended imaginary structures using strategically placed multiple layers of kitchen cling film and tin-foil. My main motivation is to push my boundaries and hopefully to baffle anyone who would stumble upon my artworks. Leeds is quite an active scene and quite friendly as opposed to places like London, the northern cities tend to be much earthier and warmer in outlook. Leeds has a strong DIY ethic, this is due to the flow of funding you tend to find in the capital is completely lacking in Leeds, so getting out there and creating your own scene from whatever you can scrounge and gaffer tape together seems to be the best mode of attack. I’ve dabbled in the gallery scene for around 5 years and been involved in some group shows, but so far I haven’t found any that really stood out. My main priority at the moment Is to do more installations rather than the straight white wall approach that’s favoured by many galleries. Travelling to various spots is something I crave to do more but being the archetypal starved artist such opportunities are frustratingly few and far between. Over the years I’ve been lucky enough to be invited to paint around various countries in Europe including the Netherlands, Germany, Sweden and Croatia which all have their own distinct flavour compared to the UK. My current location love is a derelict print works in Leeds, which, unfortunately is currently being raised to the ground to build new homes. 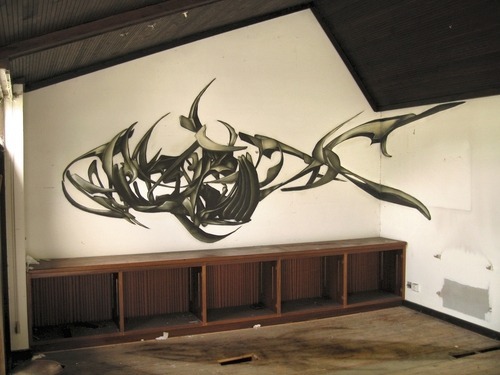 This locale was the birthplace of my multi-layered Clingfilm/anamorphic illusions so it’s ground zero of something unique in the world. I want to try out so many styles, some looser and simplistic, some more taking the 3D art further by using many different techniques to enhance the illusionary effect further. I’m trying to build towards creating huge sculptural pieces made in all manner of materials be it metal or cheaper materials like assorted household products and then creatively use natural or artificial light around to best fit them into their environment.